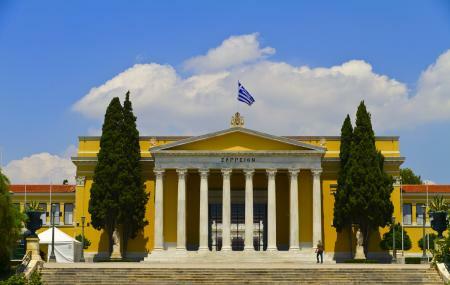 Having been witness to a lot of historical events, the Zappeion is a Conference and Exhibition Centre that stands inside the National Gardens. The architecture of the centre along with the surrounding gardens and beautiful statues make for a picturesque setting. What strikes the visitor as he views this building from outside is its huge crescent shaped neoclassical façade.The Zappeion was built as part of the revival of the Olympic games in 1896. Even though you cannot visit this attraction from inside, you can still enrich your tour to Athens by atleast having a look at it from outside. Also, visit the popular attractions in the city by following Athens itinerary 7 days. Entering the Zappeion premises, without being a member of any ongoing conference, is prohibited. People normally club together Parliament and Roman Agora while planning their visit to Zappeion. I found this by accident. It's mainly used for conferences and talks. It's a fantastic building with great architecture. Just outside there's a lovely working fountain. It's clearly used by locals, as you can often see them walking slowly and admiring the various buildings. It's also quite busy for joggers. inside the temperature is lovely and cool on a hot day. For the best photo's, try and get there before 10am as the sun won't be in your camera lens. There's a cafe right next door. I didn't have the time to visit, but it looked very popular with the locals. On you way out - with the Hall on the right, and once you walk through the trees either side of the walkway, I would recommend turning right and walk for about 5 minutes and you will be at Sintagma Square. An absolutely terrific architectural feat in Athens. The archaic style opens eyes and heart. One really feels transported to Ancient Athens waiting for Pericles to walk in and begin a debate on politics! The gardens and the fountains are nice to walk around, don't be afraid to stick your head round the door and look at the courtyard. There's also a dudes head behind the plaque on the right. Try to ignore the engraved Comic Sans if you can. This is why a star is missing. An impressive building worth visiting, at the center of Athens. It's not just the building itself; it's the history that lies behind it.